The other team. I think their socks are red, or something. Another day, another good start by Jacob deGrom. As the soon-to-be National League Cy Young winner has done all season, deGrom truly put the Mets in the best position to win. Without the third inning, deGrom really doesn’t have any messes to escape from. A walk here, a two-out runner there. Never having to deal with multiple runners on. But, alas, the third inning did happen. It looked like deGrom had a clear path out of trouble, though. Rafael Devers and Christian Vazquez singled with one out in the third, putting runners at the corners for deGrom. His first baserunners of a game which, to that point, had seen him match Chris Sale punch-for-punch. Even after a Mookie Betts sac fly to center field scored Devers, two outs to the red-hot Brock Holt seemed preferable. Of course, even preferable scenarios can end badly. Jumping on a fastball deGrom left over the heart of the plate, Holt smashed a ball to right-field for a two-run homer. Given just how…let’s say inept…the Mets have been in deGrom-started games this year, that appeared like it could be enough. Despite this, however, deGrom quickly returned to form. Against a lineup known for its ability to not strike out — specifically against right-handers — deGrom recorded 12 strikeouts across seven innings. And this time, he was even rewarded for keeping the Mets within reach! What a concept! Even if the game was ultimately decided with Seth Lugo on the mound, deGrom held the Red Sox long enough for the Mets to tie things up in the seventh inning. For those keeping track at home, this was also deGrom’s 10th start in 2018 with double-digit strikeouts. It was also his fifth 12+ strikeout game. 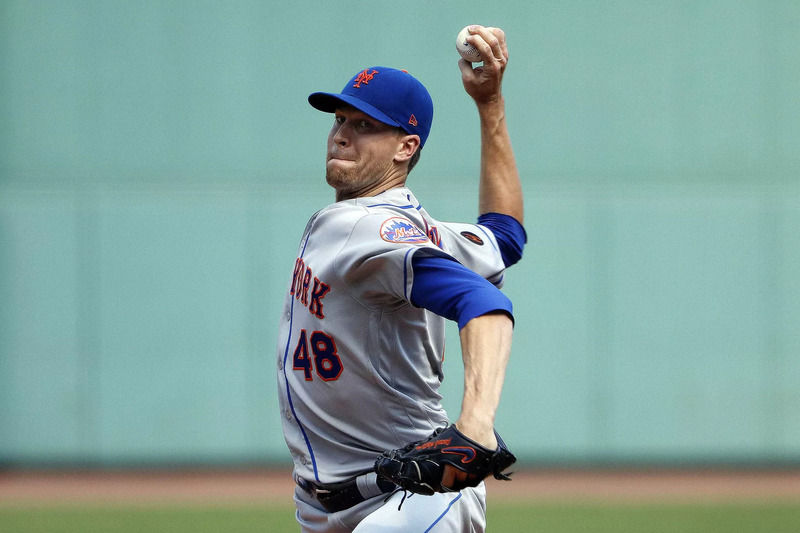 Sunday also saw deGrom extend his career-high season-strikeout total to 250, and gives him 982 career strikeouts. Translation? Jacob deGrom, the 2018 National League Cy Young award winner, has been really freaking good. This week doesn’t feature an offense portion because, well, not much happened at the plate. Jay Bruce got caught stealing. Michael Conforto recorded a multi-hit game for the sixth time this month, and has generally been on fire. Given Conforto’s weird overall season, it’s pretty incredible that he’s clawing his way back to the .800 OPS mark. After Sunday, Conforto owns a .776 OPS with two weeks left to play. Largely enough, the same can be said for the other guy who recorded two hits on Sunday — Amed Rosario. It’s probably fair to say he’ll eclipse the .700 OPS mark before the season ends (currently .693) and he has shown flashes of what could (eventually) be a usefully hitter down the stretch. Even if Sale kicked off a bullpen game for the Red Sox, their bullpen proved insurmountable in the end. The Mets fought hard to tie it up, and Lugo surrendering one extra-base hit proved to be all it took for the Red Sox to put it away. The positive, sort of? This series was the first the Mets have lost all month, as they have played much better down the stretch. Maybe it’s fool’s gold going into 2019. Well, no maybe. It is fool’s gold. But it keeps us going. You can feel free to decide if that’s a good or bad thing. The Mets square off against the Philadelphia Phillies in their penultimate road series of the year. Zack Wheeler will face Jake Arrieta, as the Mets look to end things on a high-note leading up to the final week of the 2018 regular season.